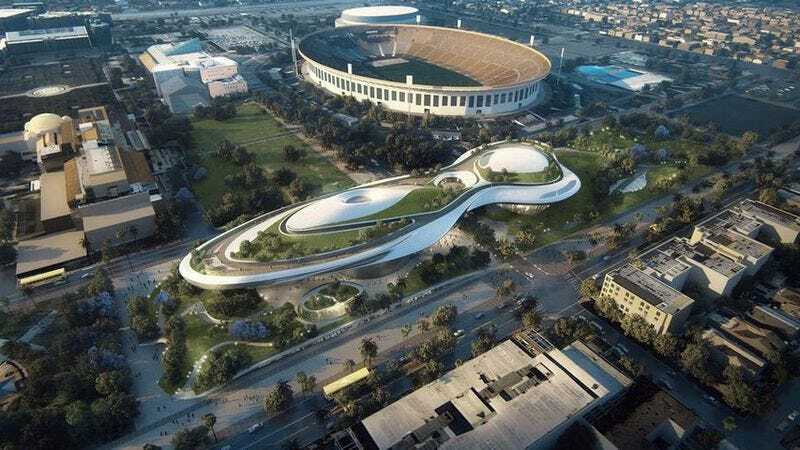 In January, Los Angeles announced that it would be making some room for the George Lucas Museum Of Narrative Art that Chicago had so much trouble with, and now the Los Angeles City Council has formally granted Lucas and his wife, Mellody Hobson, the specific location they wanted in the city’s Exposition Park. Groundbreaking will begin at some point next year, with the museum itself scheduled to open in 2021. This news comes from Variety, and the story says that the museum is “a gift to the city of Los Angeles” that will come with an endowment of “at least $400 million”—which Chicago could’ve had if certain groups had been willing to break a silly law about building things on the lakefront. During the city council meeting, Lucas offered some details on why he thinks this museum will be important, explaining that popular art “appeals to people emotionally, but also tells you something about who you are,” and he made a point to talk about the many important things he learned while studying at USC, which is right next to where his museum will be located. Considering how much of a mess the Chicago project turned into, buttering up the city seems like it was a solid strategy. The museum will contain “about 10,000 paintings, illustrations, and other items,” including stuff from the Star Wars movies, Casablanca, and The Wizard Of Oz. Glenn Danzig is apparently directing a "vampire spaghetti Western"